Even in Vermont, daffodils are blooming, herbs are rising from their winter slumber, and roads are (finally) being graded. Sometimes I could do without the winter, but then I wonder if the spring would be as sweet. If I lived somewhere that had pleasant weather for most of the year, would I be as excited about spring’s glorious arrival? 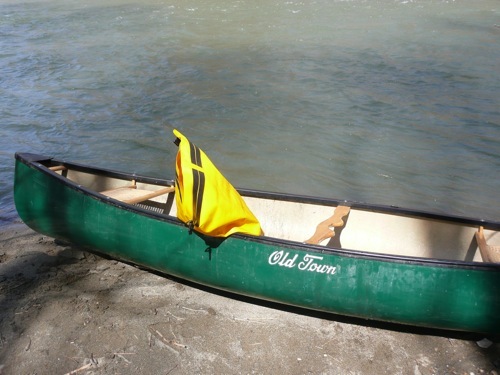 My husband and I have created a tradition that is all about spring–we ride the mighty Hoosic River in our trusty canoe. This is our third year doing the run, and it’s certainly not for the faint-of-heart. While “mighty” Hoosic is a bit of an exaggeration, the river runs fast at this time of year from the snow melt running down the mountains and early spring’s inclination to dump massive amounts of rain. The first year we did it we waited until May to ride. This trip was a languid three-hour tour, with ample time to eat a picnic lunch, tiny sections of quick water, and numerous squeezes through narrow, rock-filled streams of water, involving us getting out and walking in the icy water and rendering our brand-new-used canoe heavily scarred. Last year, we took advantage of a freakishly warm 70 degree day in early April to really ride the river, quickly, in half the time it took the previous year. Having never attempted such a raging river in anything other than a raft, complete with experienced guide, it was an exhilarating (and scary) experience. So you don’t think that we were totally out of our minds (as several passer-bys did while we were launching the canoe), my husband is a champion Boy Scout merit-badged canoer, and he does the steering…and we were both securely strapped into life jackets just in case. This year, the verdict was that it was fast, but less so than last year. The weather was amazing: clear blue blue skies and sparkling full sun. We spotted lots of waterfowl, including a couple of red-headed ducks that I had never seen and couldn’t identify (and I’m from MD’s Eastern Shore–we know our waterfowl!). We were the only canoers out there on that beautiful Saturday. We’re considering telling friends about it to plan a river party next year, but on the other hand, it’s the perfect spring secret.